Eating healthier can seem like an expensive choice, but many healthy foods and dishes can be made on a tight budget! Planning ahead and making strategic decisions can help you make healthier choices while keeping your budget on track. 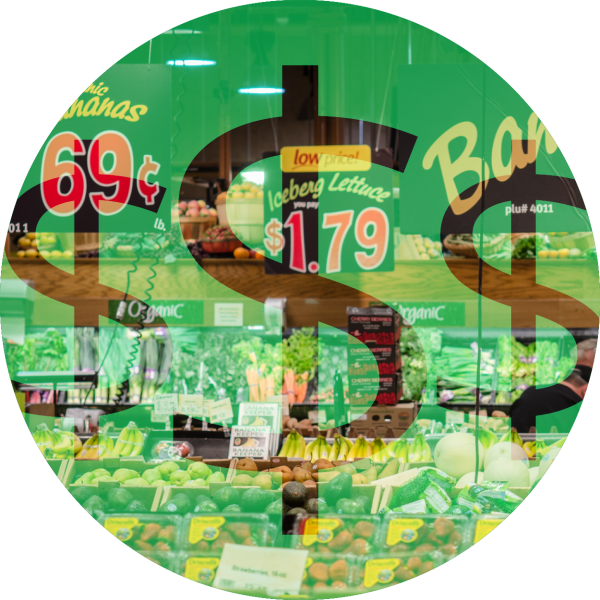 Here are some tips on saving money while eating healthy. The biggest impact that you can make on your food budget is planning ahead. Planning ahead means saving money with coupons and sales, planning to have enough leftover foods at home, and planning to make healthier choices. For more information on the benefits of meal planning and some tips on how to do so, see MyPlate.gov for daily meal plans. The generic or store versions of most food products are usually cheaper than the big brand names and usually taste the same and have the same nutritional values. Generics aren’t always cheaper though, so make sure to compare prices. If two boxes of the same food are different prices, check the price-per-unit. The more expensive option could actually be a better deal depending on how much food is in it! It’s kind of a tricky concept but grocery stores often help you with the math by showing the unit price in a corner of the price tag. Unit price is usually expressed as dollars per ounce, per each, or another small unit. Whichever product has the smaller unit price is cheaper for how much food you get and is often a better deal. Plan out how much you want to spend on food for the whole month and divide that number by how many times you will go to the store (ex: once a week). When you know how much you can spend per trip to the store, it will help you make a grocery list that doesn’t put you over budget for the month. Take advantage of coupons offered on products you already want to buy by looking at your favorite grocery store’s coupons. Some grocery stores provide coupon booklets somewhere near the front of the store. Many grocery stores also have online coupons that you can link to your phone number for discounts at the cash register. Do a little research on what grocery stores near you offer so you won’t miss out on the best deals! BONUS TIP! When a deal on a non-perishable item is really good you might want to stock up! Foods like pasta, canned beans, frozen meats, and frozen veggies can all be stored for a long time. DOUBLE BONUS! Try to avoid buying things just because they are on sale – you might end up spending more than you would have otherwise. Stick to items you normally buy or items you think would be a smart, healthy addition to your family meals. Spend a little time planning your meals for the week and writing up a shopping list. Look over store coupons and see if anything on your list has a good deal. Make sure to bring your shopping list so you won’t forget anything at the store! Sticking to items on your list will ensure you don’t spend extra money and that you won’t buy anything you don’t really need. If a traditional shopping list isn’t for you, you might like a shopping list app for your smartphone or tablet. There are many free shopping list apps that can do more than the lists made with paper and pen. For example, some apps will let you save previous shopping lists so that you can remember what you normally buy and use the same list over again. It might not be a fun task, but looking over your receipt from the store can give you a lot of information and help you save more in the future. Look at what items cost the most and least and evaluate how much value you get out of those items. Some items might be more expensive but are worth a little extra money because they add convenience to your life or because they are a healthier choice!